Bianconi Drive, Clonmel to Grannagh Castle: This year’s drive was a wonderful success despite the cold, wind and a few showers. 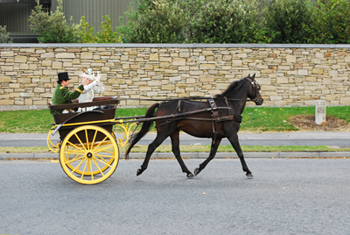 Billy Meany, Ballinerla, Kilmacow, led his team of ponies and traps accompanied by Mary Corcoran. The drive left Clonmel at 12noon, going through Kilsheelan, Ballydine, Carrick-on-Suir, Piltown, Mooncoin and onto Grannagh Castle. The Trap Drivers and their passengers were dressed in period costume. There was a pitt stop at Anthony’s Inn, Piltown, Mooncoin and onto Grannagh Castle. 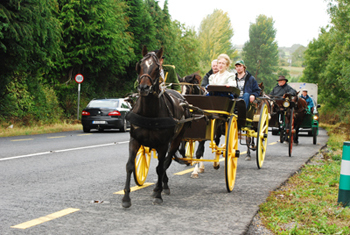 This was the seventh Annual Pony and Trap Drive raising a total of €43,217 including this years event, which raised €4910. Marfan Syndrome Research appreciates Billy Meany’s generosity in organising another wonderful Drive. There is enormous skill and careful planning in organising such an event. Billy has seen at first, the fruits of Marfan Research through the successful major open heart surgeries performed by Professor Mark Redmond on four members of his neighbour’s family – The McGraths. Sincere thanks to everyone.